Oh, the food! Today I bought a gym membership, which should give you an indication of how out of control the food was this weekend. In a good way. But I’m going to the beach in two weeks and I need to get things under control! So on Wednesday, Eric’s dad and brother came into town and we went to the legendary Thurman’s. I had the Jaeger burger…look at that thing! It was so good. I have yet to master food photography, but you get the idea. Thurman’s was featured on The Travel Channel, which is pretty much all I watch on TV. The interior was a lot smaller than I thought it would be. No wonder it’s so difficult to get a table! This was the third time I’d gone there but the first time I’d actually got to eat. Usually the wait is too long and I just wander away somewhere else. I guess you could say that the restaurant is Columbus sports and beer themed. Note the deer in a Crew jersey and the Budweiser-plastered ceiling. On Thursday I went out with my friend Zoe and got wasted. Look at my eyes. This was literally the best picture. My God. On Friday I went to dinner with my dad at Brazenhead and had a delicious Rueben, but I forgot to take a picture. Bummer. On Saturday I went to the Reds game with Eric’s family. As is their tradition, we went to Hofbrauhaus and got wasted and ate sausages. 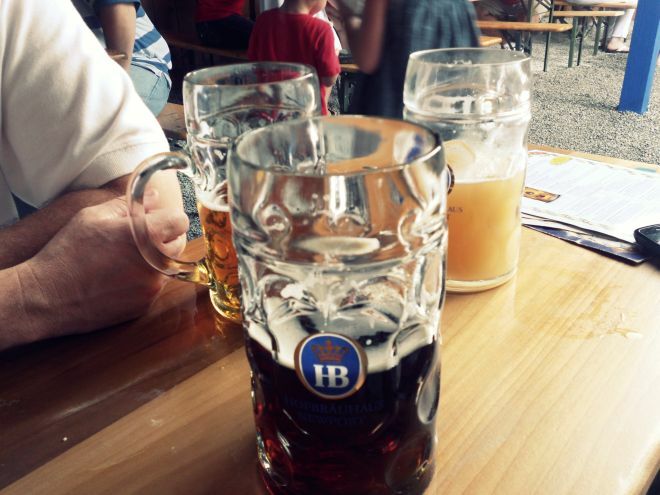 I had the Hofbrauhaus Dunkel…it was so good that I drank two liters! And still managed to be sober enough to take a picture on the way to the ballpark. Is this the first baseball park you’ve ever seen on a fashion blog? Just wondering. I feel like it’s not a topic that’s usually covered. Now I’m so ridiculously bloated, but that’s okay. I have my workout guru Zuzana to guide me. I love doing these workouts from BodyRockTv. They are SO CHALLENGING but also fun. I’ve sort of done them on and off for six months, but even with minimal effort I can tell that I’m a lot stronger than I used to be. I’m also beginning their eating plan. We’ll see how that goes. Obviously I’m not going to Thurman’s again anytime soon. wow that place looks amazing! eating good food is pretty much my favourite past time, looks like a fun couple of days! I love the random deer head in the sports bar. Looks like good summer fun! Wow those fries look fantastic, I am the BIGGEST potato fan haha. I actually just fried up some curry potatoes last night in a spring roll form. Hmmm… can't wait to see some again later. man vs. food – good show. I am going to check out bodyrocktv, there's another good one toneitup.com they're pretty cool to follow and have workouts on youtube that I use for free! I love free stuff 🙂 well anyways, im now following you! Hope to hear from you soon! Mmm, that burger looks so delicious! My stomach gave a ginormous rumble!